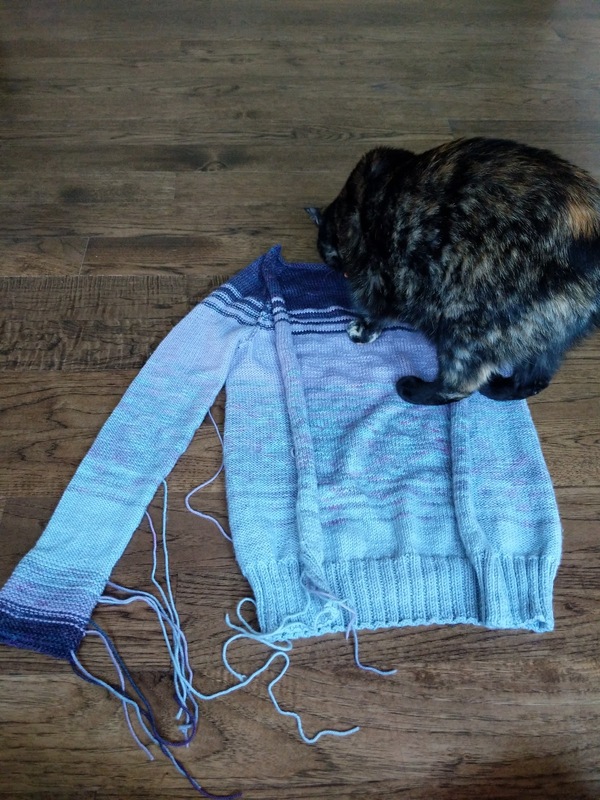 The alternate title for this post could be: What the Hell is a Rundown: Emily Tries to Read a Knitting Pattern. 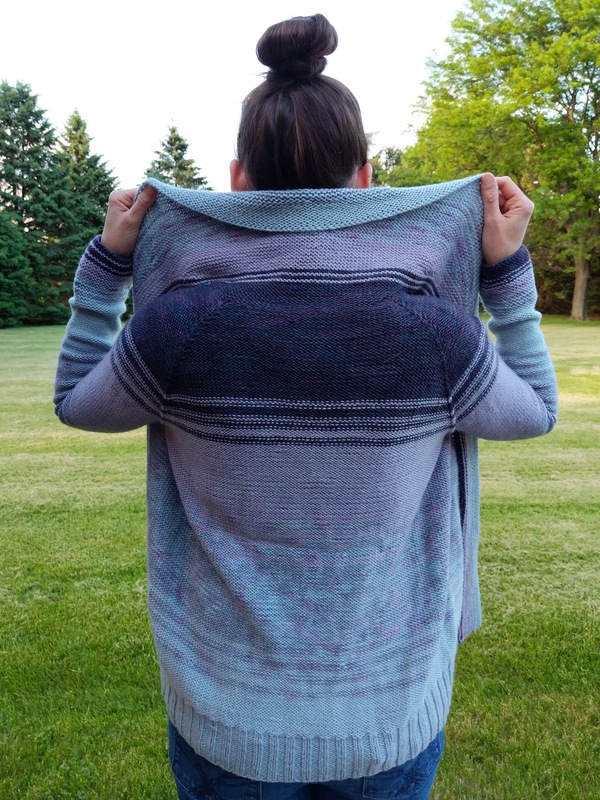 But somehow I did, and ended up with an actual, functional sweater! 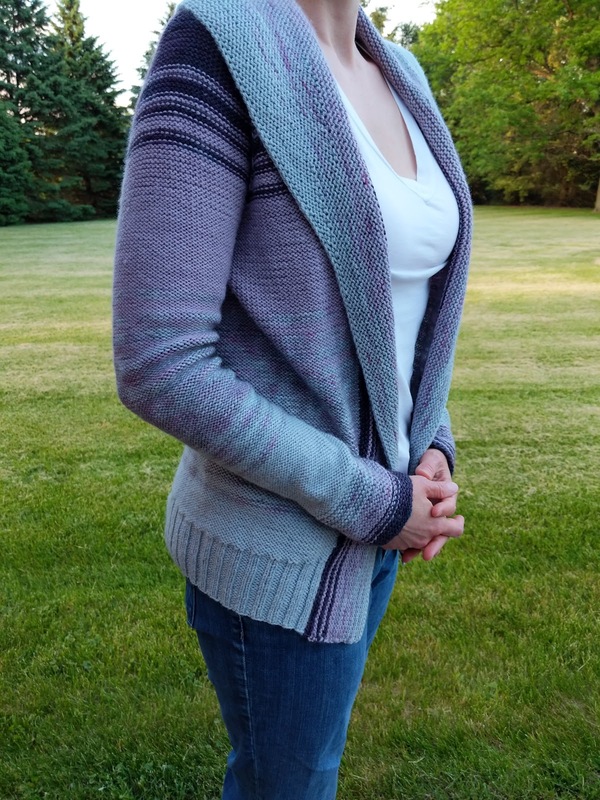 I'd been eyeing this pattern (Drea Renee Knits Comfort Fade Cardi) for awhile, so when my LYS offered a class, I got officially motivated to try it. In 4 sessions, spread out over about 8 weeks, I made this happen. Choosing the yarn: I've never knit with animal fiber before because I'm concerned with the treatment of the sheep. 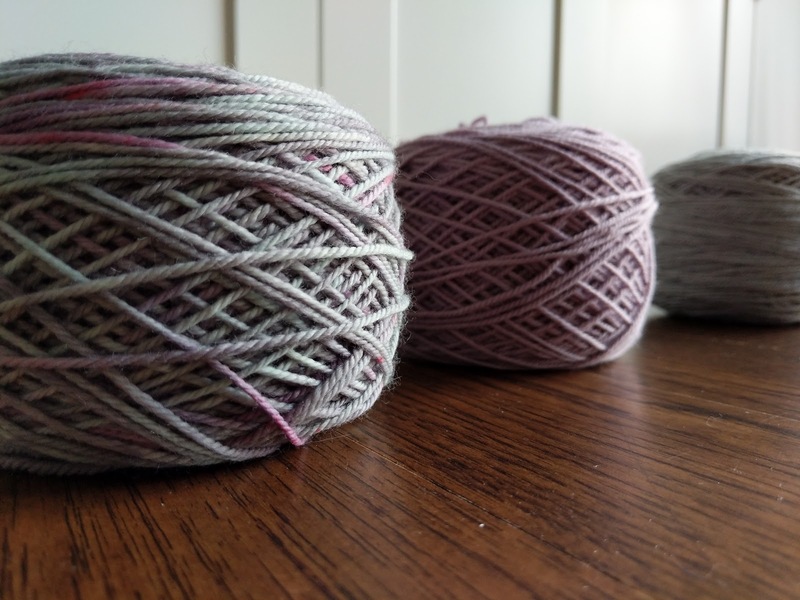 After doing some research, I landed on Tanis Fiber Arts, a small Canadian-based seller with beautiful colorways and as close to ethically sourced fiber I could find. I was thrilled with the quality of the yarn and love that it's a small, family-run business. I would definitely buy from them again. Casting on & the yoke: I convinced myself that I was doing something wrong, but since I was doing it wrong consistently, it would all be okay. At the next class I was reassured by the class instructor that I had done it right. The process just seemed too easy to be true. 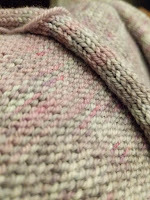 The body: I really enjoyed this part of the knitting. The fade sections added a little challenge and was something to look forward to. The sleeves: Ah, the sleeves. I definitely needed help from the instructor when starting up the sleeves. Once I got started though, it was pretty easy. I could use some practice carrying up the colors... there are some pretty jacked up areas where that did not go particularly well. But I don't think it's super noticeable after the blocking. 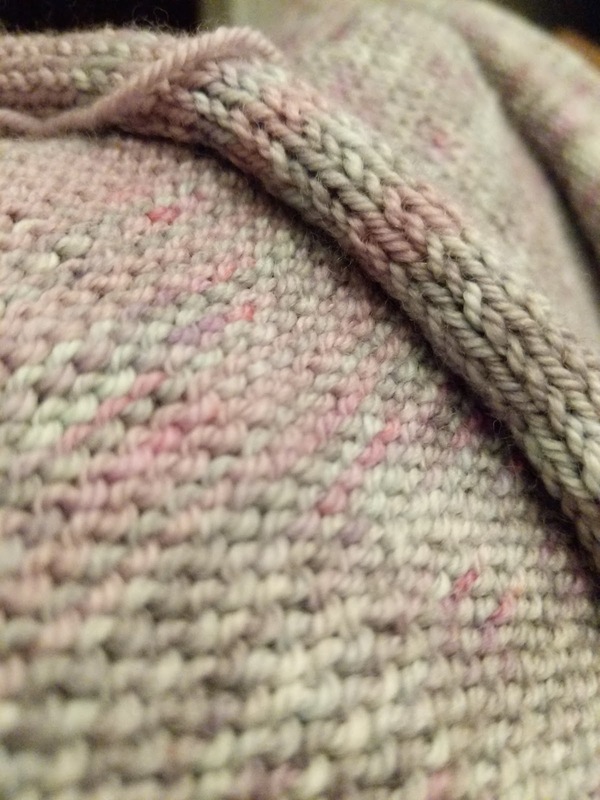 I knit the first sleeve inside out so I wouldn't have to do "all that purling," but then I couldn't figure out how to do it with the second sleeve, so I just ended up doing the sleeve as written. Turns out I didn't really mind "all that purling." The collar: I wasn't nearly as scared about picking up all those stitches as my classmates were. 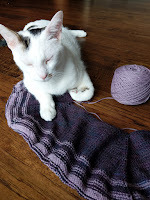 I'd done it before for the Hue Shift Afghan. NBD! But then it took me at least 6 attempts to get the right amount of stitches picked up somewhat evenly and I convinced myself it was okay it I ended up with a wonky-assed collar just so I could FOR THE LOVE OF GOD MOVE ON FROM THIS PART! I was nervous about the short-rows, since the only other experience I've had with them yielded ugly results. But I found this part really enjoyable. The blocking: I had to get lots of advice from Greta about this, since I was basically told this could completely ruin the sweater if I did it wrong. I think I did end up over-blocking it, since I was too lazy to get out a ruler and do measurements. But in the end, I tossed it in the dryer for a few minutes and I think it turned out okay.